Reviews submitted by visitors to the Mountain Passes South Africa website. Ben 10 was a “Bucket List” event come true for me. The tour was well organized , taking all the unforeseen in its stride. The tour guide always giving just enough info on the route. The overall smile and enjoyment factor for me was 12 out of 10. If the Ben 10 continued for the next week , I’m in ! Thank you very much for the well organised tour. It was very worth while.Your leadership and temperament gave us comfort and confidence to successfully complete the Ben 10. I just wanted to let you know how amazing I think this site is! Informative, interesting, comprehensive, inspiring and beautiful. Thank you. Have shared it. This tour appealed mainly because it covered our local area. We had already completed about one third of the passes explored on this trip but are always looking for new adventures and this was a great way to visit other passes in the area, some we had heard of and some we had not. It was also a chance to meet like minded individuals but the biggest thing we took away was the knowledge shared by Trygve with the group, the history, the ways the passes have changed over the years, local folklore etc. All in all a very interesting day and we will definitely be along in the future on other explorations. It was really an extremely insightful drive and the weather played along nicely. The passes we visited and the accompanying surrounding nature vistas was magical, even the very short Koppie se Nek pass had something to offer. Your knowledge is just astounding and one can appreciate the huge amount of effort that went into fuelling your passion and making it a memorable event for us. I do quite a few thousand kilometres of dirt road travelling every year to get to DWA and other Water Board pipelines and often wondered about the history of such remote roads and mountain passes, especially the “actual” roads that traverse the farm properties and most often go right past the backdoor of the farmhouse. So this is right up my alley, I like it very much and would like to learn more of this side of our country. I would like to thank you, Shaun and Lisa on the tour you gave us on Sunday. It was extremely well done and very professionally handled! I have and will recommend joining MPSA to everyone I possibly can! Your knowledge of the area was outstanding and the stories you were telling were honestly captivating! We thoroughly enjoyed every second of it! My daughter (Bianca) and I have just completed the Ben 10 Eco Challenge in a most unusual way. We rode bicycles that I made myself from some scrap steel that was lying around in my workshop added to a load of second hand parts such as wheels cranks etc. I also made our own wheel hubs, bottom brackets ( crank axles ), handlebars and stems. Cost of steel for the bikes was R130 each. They are very simple bikes with no suspension, single speed and pedal-back rear brakes. Weight is around 20 kg each. In addition, to make life more difficult, we limited ourselves to a budget of R20 each per day for ALL food and drink. This means no energy drinks, bars or gels. No Coke-like drinks, no chocolates/sweeties etc. We make our own drinks with water, a bit of sugar and a dash of lemon juice and salt. We also had no back-up during the rides up and down the passes so had to carry extra kit such as rain jackets, tools, first aid kit and sandwiches. The first pass completed was Joubert's on 13 October and the last was Otto on 19 October. Thanks for a fab website. We intend to peruse more passes and come up with an even bigger challenge. BLISS = 26 passes + 2 days + 800kms + 2 hidden gems! Could I possibly let this chance slip through my fingers? I LOVE mountain passes! After joining the group at the rendezvous point we set off on the old Du Toitskloof Pass. The strong south-easter pumping down the one valley provided our first scare/thrill! We travelled the Tradouw Pass in both directions and the stop at the old stinkwood bridge is special. An old favourite, the Seweweekspoort never fails to amaze. The start of the pass also provided the first hidden gem. We happened across the spectacular dam wall of the Tierkloof Dam. After the Seweweekspoort we traversed the Boschluyskloof Pass which must provide one of the most spectacular views across a vista stretching forever in an easterly direction. The second hidden gem was the lovely lodge at the bottom of the pass. We received a welcome drink while three kudus watched us. My room had a shower with a view and the three kudu watching was very special! The next day dawned with a spectacular sunrise. We even encountered three klipspringers lying on the pass as we left. No one is rushed around here. The Gysmanshoek Pass across the Langeberg has been on my bucket list for so long and did not disappoint. The fynbos was beautiful and reminded me of my childhood walks in the Southern Cape. The passes that followed all along the Duivenhoks River at the foot of the Langeberg all the way to Suurbraak are very different in a calm, rural way. My lasting memories of this amazing week-end are those of a really well-organized tour packed with information but so relaxing. The road less travelled has so many thrills and hidden gems. Where can I sign up for the next one please? In school we learned about two engineers, Bain and De Smidt,who designed and with the help of Italian prisoners of war,built many passes, with no fancy equipment, most of which are still driven today. None of it held much significance until we had the privilege to join the informative Trygve on his road trip to appreciate and explore first-hand almost 25 of these passes in the Western Cape. As a result of these beautifully built passes, we were able to enjoy some of the most spectacular and scenic drives in the region. When we think of this trip, what comes to mind is stone walls packed by hand on slopes sometimes so steep one can only imagine how strenuous the task must have been, with high craggy rock formations and roads disappearing around bends in the distance, landscape variances all the time, steep deep drops from the road verges, sandwiches and comfortable conversations at stops. Highlights for us were the overnight stay in the sumptuous thatched cottages at the 4 star Boschluiskloof lodge, surrounded on all 4 sides by mountains, with a sense of complete seclusion and safety, and the next day, on top of Gysmanshoekpas amongst the proteas and fynbos. Thank you,Trygve, for a stunning trip! A few years ago we fell in love with “ pass-driving”, to the extent that we acquired a Fortuner, so we were very interested to join the Aristata Tour of many of the tar and gravel passes in the Southern Cape. We joined 3 other vehicles at the Engen 1 Stop on the N1 and drove over the Du ToitsKloof Pass en route to our overnight stop at Boschluyskloof Lodge, at the base of the Bosluiskloof Pass. On the way, we were joined by Howard and Amanda who had overnighted in Robertson. We had a look at the interesting bridge being constructed in Ashton to overcome the dangerous flooding that occurs with heavy rains. Basil Read, the construction company entrusted with building the bridge has been put into business rescue, so the bridge will not be completed in the near future, much to the dismay of local residents and businessmen. We traversed the famous Thomas Bain constructed Tradouw Pass from north to south and back, enabling Trygve to film the pass and we enjoyed the spectacular views of the various river gorges. After the Tradouw Pass we headed for the star of the show, the Seweweekspoort, a De Smidt masterpiece that follows the meandering Seweweeks River for 17 kms. The poort needs to be driven slowly to fully enjoy the engineering feats as well as the show that Mother Nature provides with the incredible flora as well as the geographic contortions of the Cape fold mountains. Next on the itinerary was the spellbinding Bosluiskloof Pass which we navigated to arrive at Bosch Luys Kloof Lodge, a welcome oasis in the dry bush. Luxurious accommodation with splendid meals make this lodge a compelling reason to drive the pass. Sunday morning after breakfast we retraced our tracks over the Bosluiskloof Pass and through Seweweekspoort to Ladismith to refuel, thereafter the longish tar trip to the Miertjieskraal turnoff from the R232 to get to the Gymanshoek Pass. Imagine our dismay when we saw the sign indicating the pass was closed! Anyway, all democratically decide we would go as far as possible and turn back if need be. At the top of the pass we were met by an oncoming vehicle, the driver indicating the pass was open and we continued on our merry way over a very interesting, and what could be a challenging pass in winter. After Gymanshoek Pass we drove 5 consecutive gravel passes to arrive at Suurbraak, where the tour came to an end. Many thanks for a fantastic website. We have just returned from a great trip to the Eastern Cape, and the information on your site immensely enriched our experience. In fact, I would not even have known about a fraction of the passes in the area had it not been for the MPSA site! We did Bedrogfontein, Suurberg, Katberg, Michel’s and all the major passes of the Ben10 challenge. The most difficult pass technically was Bastervoetpad, as my wife put it we had the pain without the scenic pay-off, as we had driven the pass in thick mist where we could only see metres ahead of us, relying on the GPS to show the way. Ben Macdui still had snow around, which resulted in lots of mud. We could get to 2950m and no further due to the mud, and walked the rest of the way to the summit! Lundin’s Neck was extremely badly eroded at the Southern end, it is doubtful that any vehicle that is not 4x4 will make it. The whole trip was done in a stock standard Suzuki Jimny, what a trooper! It simply went everywhere, even where adventure bikes turned around (Ben Mac). It was great to see the signs denoting the Ben10, hopefully it will encourage tourism in that stunningly beautiful part of our country. The sign at Lundin’s Neck was lying flat on the ground, whilst the one on Otto du Plessis was ripped apart by the extreme wind. Bastervoetpad had no such sign. Great site. Just came across it for the first time. Well done! I’m very much interested in passes due to my love and passion for adventure trips. I recently acquired my first adventure motorbike and some passes impassable to be prior, will now be on my bucket list, especially the gravel/4x4 type. Let the adventure begin as I would love to ride each dirt pass in SA over the next few years. I will be sure to contact Johan from T4A for further discussion and planning. Thank you again! Firstly I need to compliment you on your wonderful website. Everything is wonderfully researched and documented! Can't wait to tackle a few of the not so frequently traveled passes in the next couple of weeks. Thank you for hosting this incredible website and all its content. Its great! We have driven all over the country & driven many many passes - your web site has been absolutely invaluable in all our planning - thank you. Once again, I would like to thank you, this time for your Mountain Passes talks on Wild Coast FM. I saw it advertised in your regular e-mail communications and I now listen to it every Monday afternoon, using the web based “Tune-In Radio” on my PC (I live in Roodepoort in the Greater Johannesburg area). Today was especially very interesting, thank you very much. Many thanks for being an integral part of the Ben 10 Eco Challenge. This was for all of us concerned a truly unique experience. To say the trip was epic was an understatement…. We completed 2 days well into the evening (TTT and Lundeans Nek back to Millards). But hell, what a rush and experience. We commenced the trip on the 26th travelling to Lady Grey and then via the various passes. We were under time pressure from the get go as a result of the breath-taking views and vistas, requiring endless stops to take in the sights sounds and amazing beauty of all 10 passes. Wow, what a web-site you guys have! The website was becoming too much of a distraction at work; your content is far more interesting than the computer program I need to write! I discovered your website about 3 or 4 days ago. This morning I purchased an annual subscription. For me, that is a record from sample to full version! It is a testament to the quality of the content. The paid content did not disappoint! I like the way that you describe the route; that way we the travelers know what to expect. 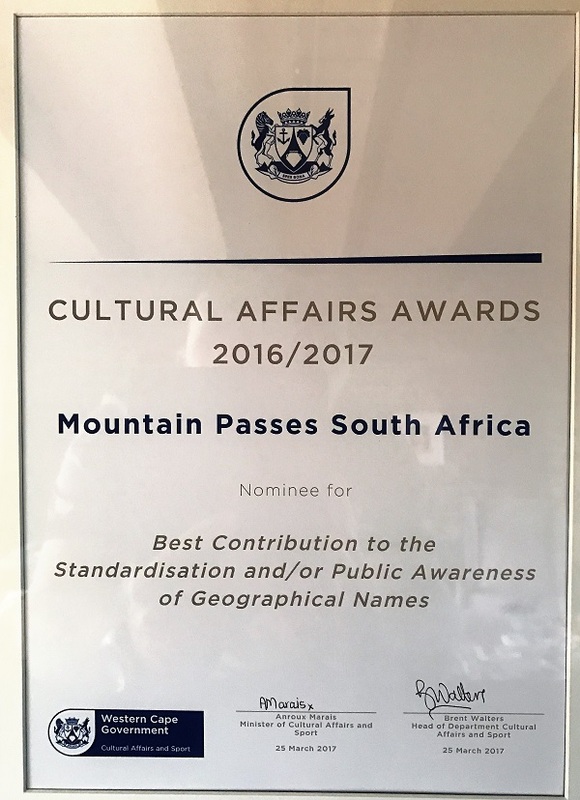 Congratulations with the award and thanks for the new Swartberg Pass footage… fantastic quality!! I traversed it three times in the week just before it washed away last year, in the process also going down to “Die Hel”. Fantastic work you are doing… keep it up and proud to be subscribed. I'd like to take the opportunity of thanking you for a wonderful web page. Apart from the weekly Thursday internet travel via your newsletter, we also spend a lot of time searching for new passes to adventure as we plan various trips around the country. Living in the Soutpansberg, we drive to Cape Town at least once a year and take great delight in making detours in order see a new spot and tick off a new pass! Fantastic service. Getting to know areas of our beautiful, if tragic, country from a man who goes the extra mile to research and personally experience the routes he writes about. Class act. My first port of call to discover new passes and drive gravel roads I have not seen before. The information on the website is accurate and prepares one for what to expect during the journey. The videos are great - to see the actual pass before driving it. The dedicated work done here is amazing. Great to show people what we have in our beautiful country. Always take the back road !! As someone who loves travel and South Africa and feels that geographic knowledge is important as well as interesting, this is an awesome site for information and reviving memories of journeys past. It is an extremely good way of planning trip to see passes. Great Facebook page and website. Really well informed. Brilliant work, and lots of potential for expanding into other things of interest even for the armchair traveller! Thank you for this fabulous site! We have had a wonderful time retracing our steps and learning lots of new stuff here on your site. Appreciation from the travelling botanicals. Hi, I an an astro-photographer and always on the hunt for interesting scenery and rock formations in desolate places to include in my photos. Your mountain passes website has been immensely useful to me and I wanted to thank you for making all these cool videos that spared me from having to drive them myself. Many thanks and happy driving. Thank you Government of the Western Cape for this recognition! Thank you for a superb website . The referencing and research you have done made the planning for our trip a breeze. Thanks a million and keep up the great work. Next trip is already being planned. A Big thank you!! I have always wanted to explore some of our countries most beautiful places but never had the know-how. I subscribed to your site, suffice to say we had the most amazing journey due to your sites information. It's because of your excellent reviews and videos on this website, that my husband Manie Blignaut, arranged our holiday during March, 2017 around certain passes. Our two week holiday took us over Otto du Plessis Pass, Jouberts Pass, Seweweekspoort, the Gamkapoort dam, Camdeboo Pass and many more. It was a fantastic, life-enriching experience. Your information is always 100% accurate. We appreciate the work you do. I snapped off my rear-brake lever on the 1st pass and had to do the whole BEN10 with only a front brake... only to have my front-brake completely fail down Carlieshoek Pass from overheating, sending me careering downhill with zero brakes. I did almost die. What saved me was switching off my engine and using 1st gear to grind me to a halt just before a corner that would have sent me flying off a cliff to my death. I later discovered that my front brakes had heated up so much (from overuse because of not having a back brake) that my brake fluid had boiled. Also, brake fluid boils at lower temperatures at that altitude and breaks cool less due to the thin air. So, I recommend that EVERY biker bleed their brakes and replace the fluid with DOT4+ (which boils at 180 degrees - regular DOT4 boils at 160 degrees) before doing the challenge - just to be safe. I eventually got down the hill by using string tied around my boot to pull my rear brake. I then changed my brake fluid to DOT4+ at the next town and all was OK again. Urs and I would just like to thank you personally for the wonderful work you have done, and do. In completing the Ben 10 this last long weekend we met other ''chasers'' along the route, which was a real delight. Some great people. A BIG thumbs up to Llesyri .....and Bruce (who actually live in the Dominican Republic). For a petite lady she definitely ''THE MAN'' for getting her Honda up and over some of those passes ;-) The hotels and motels along the way should also give MPSA a thumbs up for attracting the Eco tourists to their beautiful neck of the woods. Keep up your good work. Congratulations on an excellent website – in particular your focus on safety and driving responsibly. I have managed to complete a number of “hairy” passes such as Mount Paul and Donkeys Pass without my wife Jill “turning a hair” – all due to us following your cautious and safe approach. I would hate to know the consequences of irresponsible behaviour that results in a vehicle turning over on the likes of Mount Paul? Just wanted to let you know how much I enjoy the site. On a grey day in England, I can't tell you how entertaining it is to drive the beautiful passes of South Africa with you! I've now done a few myself during our annual visits - this year it has been the Molteno and Seven Passes Road. Keep up the good work. Thank you very much. This is one of my favourite sites. Fascinated with your article on Potters Pass. I was born in EL in 1942 My grandfather George Starkey was the Mayor. I moved to Cape Town with my parents in 1949 and returned to visit EL for the first Grand Prix. Camped out with my cousin Norman Starkey. My wife and I will be in the Boland next week and we are looking forward to exploring some of the beautiful passes in the area. Thank you for your effort in stimulating interest in all those beautiful passes. Thank you very much for this excellent site. I wish to compliment you on a fantastic and informative website that I discovered for the first time when preparing to do the Sani Pass over the December/January holidays. What an experience that trip was and thanks to your site I felt well-prepared, also to brief my fellow-passengers. Overall I really like your website and will be a regular user. Thanks for a wonderful website. I live in the Eastern Cape (Somerset East) and plan a trip over 5 of the passes (Waainek, Blinkwater, Bosnek, Katberg and Fullershoek) that you have covered on the website. I would like to say thanks for your informative site on the passes of SA. I have just returned from taking my new Suzuki Jimny for it's maiden long run. We went through the Eastern Cape highlands, and included Naudes Nek and Jouberts Pass, among many others in the 'test drive'. The information from your site really helped me decide and plan my trip... so thanks very much.. I want to congratulate you with your project on our mountain passes. This is my favourite website and apart from all the information, the website itself, is of the highest quality. I will definitely add some Northern and Western Cape passes to my list next year. Awesome! Thanks indeed for the support and congratulations on the website...It's become my favourite! Thanks Trygve, keep up the good work, your guides are fantastic! I was browsing the web on South African mountain passes and came across your website. Thanks for sharing all your info on passes in and around South Africa - it has been very helpful and interesting. I look forward reading more of your articles and look forward to doing some of your trips. A really fantastic site to view parts of our country most of us never see. Congratulations with your outstanding publication... I love it! I want to compliment everyone who was involved in setting up this website and who did all the work. This info is really extremely helpful. Much appreciated. What a fantastic site you have created! Thank you so much for your webpage and videos. I find your newsletters fantastic. A real treat. Thank you so much. Really enjoying your website and finding new and amazing roads and passes to experience. Thank you for sharing. First of all, thank you for your wonderful website. I have been using it a lot to plan my escapades (by motorbike) and when I can't travel for real, I travel with your videos. Wonderful work! Thanks so much for your massively informative website and newsletter. I find your updates fascinating, thank you! Once again many thanks for allowing us to use one of your articles for the Tankwa news. At a recent SANParks HR meeting I was pleased to hear fellow members discussing the benefits of your website so I hope we can spread the message far and wide. Thanks for such an awesome website. It is so well put together with such detail and care as well as being easily navigated. A rare thing these days for someone to take such pride in their work. Well done! Wow. What an awesome amount of good info on the website. You guys deserve all the credits coming to you. Many thanks indeed for your wonderful footage of Hogsback and the pass. Found your website very interesting and informative and realised how much more of the country I could explore. What a super article. My lady and I are visiting friends in Bedford E.C. For a couple of weeks in July and would like to follow a couple of your drives. We are all fans of your www & Facebook ........ It is amazing that you can still find roads and passes in this day and age that haven’t been uncovered and documented yet... Keep up the good work. Congratulations on an excellent website. I enjoy it and use it often. I am a mountain biker and use the site to explore routes and passes, a great information source! I am a subscriber to your website. Allow me congratulate you on an excellent source of information! How wonderful to have discovered this site. Just returned from Eastern Cape and a portion of the Baviaanskloof. It would have been a plus plus to have discovered this site before then. Congratulations and thanks for being part of the most beautiful place on Mother Earth. South Africa! Just a quick note to thank you for the fantastic website and all the work that you and your team puts into this. I am absolutely addicted to it. My wife and I have just returned from a amazing three week mountain passes motorbike trip and used your website extensively to chase down a few passes. I now have become an avid pass chaser looking to mark of each and everyone of them. We live in Magoebaskloof and run a small family business from here. On this trip we have done almost 5000 km to the Cape, going via the Swartberg and Die Hel, all the way to the Ceres mountains over the Pakhuis pass, Kouberg pass, Hoek se berg, and Kraaiberg to Wupperthal. From their back to George covering few passes in the area, over to Hogsback pass in the rain and doing a very slippery gravel road to Cathcart. We have used your website for inspiration for our motorcycle trip from Durban, taking in all the passes around Oudshoorn, George, Cedarberg. This in December, can't wait! We've been covering a number of your routes and passes by bicycle over the past few months. I have to commend you guys on your site and info you provide, there is nothing else like it! Thank you and keep it up! I absolutely love your webpage! Compliments on an excellent website and your wonderful range of videos! Thanks for a great web-site. Your website is fantastic, I must tell you. I recently discovered your site. What a fantastic one for anyone interested in 4x4, passes etc!! I'm a keen reader of your website, and have loved its evolution to excellence. Thank you for a splendid and superb web site. This is highly appreciated and I hope you will take this web site a long way. First let me convey my thanks and appreciation to you for having tackled the job of documenting our lovely passes. And what a success it is. Also thanks for sharing this information in the way you do. Me and the wife are frequent visitors to your site, sometimes to check something, but more often to just sit back and live the experience. I just love your information. Thank you for coming up with such a great idea! Driving passes is a passion! Love the site. It is my new travel checklist. Thanks for your great website, it's helped me venture on some epic road trips recently! I must say that you have done a wonderful job with your website, it is great. What a great site this is...such attention to detail and passion and great coverage, just fantastic. I was watching the Gamkaskloof series and getting all emotional. Your website is simply awesome, well done! My friends and I just want to thank you for a very informative website. It formed the basis of our Easter weekend trip where we tried to do only gravel and mountain passes, plus some port tasting in Calitzdorp. In total, we did 22 full passes and half of the Wittnekke pass. Baie baie baie dankie vir hierdie pragtige webwerf !!! Voorwaar iets besonders en pragtige bydrae tot die INTERNET !!! During December 2014 I drove the Baviaans Kouga off road route of 73 km and what an adventure it was. I was the only vehicle on this road and also camped on the route and have experienced the total remoteness, the most scenic mountains and a magnificent sunset on a road less traveled. Bezuidenhouts Pass - What a pass! Drove up just before new years on our way to Royal Natal, included the passes from Sandspruit turnoff and zigzaged our way west. Met some bikers on their way down, ignoring their warning that conditions were less than ideal; smiling, saying thats why we're here? So far, have viewed the Elands Pass video. It's great, much better footage than I got in June 2014. The drive is definitely a "must" for anyone who likes minor country roads. And the hospitality at Fonteinplaas, where we spent a night, was superb. It is really a pleasure to view these passes, South Africa is so beautiful. Thank you for another outstanding experience. Thanks for your informative website and info, I will most certainly make use of it again to find other lesser known passes in KZN and the rest of SA. Good afternoon, I have just come back from the Eastern Cape and made extensive use of your website.. I had no idea how beautiful the area was. We had a wonderful time climbing the passes in the area. Thanks for the amazing website. I forgot to thank you for an amazing web site. I just love watching the videos and reading about the different mountain passes. I am extremely grateful for the hard work that you have done. I am not a 4x4 enthusiast but I would like to travel through as many of these passes as possible in the next 10 years. What an amazing web site! I have really enjoyed reading your write-ups and learning more about our beautiful countries passes. My wife and I were in Wilderness recently and based on one of your recent posts decided to visit the Montagu Pass. What amazing beauty! Thanks for a fantastic site. I want to compliment you on a wonderful site at mountainpassessouthafrica.co.za. Thank you for a wonderful website and FB page. You went to a lot of trouble to give us a lot of travelling pleasure! Thank you! Hi Trygve, I really enjoyed your report on these two passes (Gifberg & Ouberg). It reminded me of when I took a few friends on a trip through the area a little while ago. Many thanks for your beautiful website which has the best information ever! I just have to compliment you on the Langeni Pass, job very well done! I love that road, newly built, fences are all still there- so no cattle in the road- and the turns are all just waiting for a motorbike to lean into it!! And the scenery is IS like you said, unbelievable! May I add my congratulations to you and your team for such a fine effort, and hope that you will continue to steer it on such a popular course. Just want to say,Thanx for a great Passes year! I really enjoy the Mountain Passes website, facebook page and the newsletter! A blessed and peacefull festive season to the whole team! My sincere thanks for your wonderful articles and details about mountain passes. It surely speaks of a passion which you relay to people like me. Although I have traveled a fair number of passes myself, I only recently made peace that I will not be able to cover all of them, and now with your comprehensive surveys I can even sit next to, or behind your cameraman! Thank you once again and be assured that I make notes of "visits" to enable me to make the most of your articles. I just watched all 3 videos of the Montagu Pass . Excellent ......Thank you for showing a pass which I would never have driven in my Mercedes. You have a "lekker" Job. I enjoy these passes so much that at present it is my TV channel of choice. Thank you once again. Most satisfying and enjoyable. I must say I'm very impressed with your website... It's really great. I'm a mountain biker from Cape Town and one of the things I love doing is tough climbs. Every Thursday when I sit down to work after lunch I am delighted to find your weekly News and Updates email and it ALWAYS lifts my spirits and for the next half hour or so I am transported to another place in South Africa and I need to add one or more passes to my "Must do" list. My 60'th birthday saw me making a resolution to explore our beautiful country so I bought myself a Jimny and together with my long-suffering brother, I have managed to do 2 to 3 trips every year , all based on the different passes on your site. Our latest included the Swartberg Pass, which so far must be my favourite pass and definitely needs another visit. Truly spectacular. This is just to thank you all for this wonderful site which inspired me to explore beyond the beaten track and has truly enriched my life. Kind regards, Jenny. Only discovered this website today. What magnificent work you have done to bring this into our homes. Thank you. Wonderful videos and info, yet again. Many thanks for all your hard work, Trygve. I feel an attack of fresh air and wide-open spaces coming on. Much appreciated, kind regards - Karen. Thank you for the very informative and valuable website. Just want to thank you for this excellent site. My wife & I enjoyed the 7-passes (between Knysna & George) recently. Although we knew about them for some time we did not know about the hidden gems on the way back from George - White's & Heights Rd, Hoekwil Pass, Ruigtevlei Pass & Barrington Pass. Please keep up the great work!! I am briefly writing to tell you that although I live in George, I found myself in Tstsikamma on a conference last weekend. I was on my BMW F800GS, and had a bit of time to spare on Saturday afternoon. I quickly accessed your site, read up and watched your video on the old Bloukrans Pass. Armed with all the intel I then took the opportunity to ride the pass, and am so glad I did - it was fantastic! Thx so much!!! I'm also fortunate enough to own a Land Rover Defender (Puma) and when I'm not on the bike it takes our family to wonderfully remote places all over our beautiful country. I have books on passes that I dearly love, but I have to tell you that your site has taken everything to a whole new level and is exactly what innovation with technology is all about. Well done!! Thanks for a great interest site, it suits my & my wife's travel interests perfectly. Thanks for all the hard work and detail of the web site, it is top notch and an excellent reference. The site of yours is the best I have encountered. This is really Afrikana for our descendants. The books available on passes are incomplete and centred around only certain areas in the country. Keep up the good work. Over the last couple of months your site has been of immense help to me in my planning, for this I thank you. I would like to do the Bloukrans, Groot Rivier passes. Thank you very much for your prompt service and reply. We travel a lot and after looking at your site it seems we have covered a number of the passes listed. It is actually quite amazing to see the number of named passes and here we are driving along without knowing anything of it. Your site has been most helpful in looking at routes and info. Thank you. I have just joined your Mountain Passes mailing list.Thanks for a great site. Since going to Oubergpas in July I'm very interested in the various gravel passes, especially, and will try to do many of them over the next couple of years. Thanks a lot for your awesome website! My wife and I like to drive back roads and mountain passes. In December, we will attempt to drive 2 great mountain passes - Hela Hela and the Bastervoetslaan pass. First let me commend you on a superb website! I am a 'backroader' at heart. Can you possibly suggest a series of passes we should try to include - the 1st 2 that are on the list so are Gamaskloof (Die Hel) and Seweweekspoort. If you can offer some guidelines it would be great. Thanks for the great website, it is now one of my main route planning tools with which to find the road less travelled. Looking forward to read about the not yet reviewed passes! Congratulations on one of the best sites I have visited. Have used it extensively to plan off road bike holidays. Excellent excellent excellent ! Your site is great, well done. I am driving from CT to PE with my family in August in a Hilux 4x4 and we want to take in as many great Cape passes as we can. Thanks for an amazing site. Exellent site. My wife and I plan to travel all the listed passes in all the provinces on your site in the next year. We have already done 25 of the passes in Mpumalanga. Thank you for an excellent website, full of information, which I see quite often and have derived a lot of pleasure from. We have recently 'discovered' the Mountain Passes website and it really is awesome. I have spent some time looking at the passes we will be traveling over in the next 3 weeks. Thanks for a really super website. Hello, the videos you have done of the passes are amazing , well done ! I had no idea there were so many. "Thanks so much for sharing these magnificent experiences with us"
"Your lovely website has rejuvenated my interest in the study of Mountain Passes." "I honestly think your videos are fantastic, and such a great idea!" Thx for your wonderful website. We have just spent a happy couple of hour reliving memories of the Swartberg Pass and enjoying a few glimpses of our April 2014 trip into Cederberg, Namakwa, Kgalagadi, and Tankwa Karoo. We´re closer to some of the great alpine passes here...and there are some beauts....but will be saving up to come again in 2015 and finally spend a few days enjoying Gamkaskloof. Wow, how I remember my sweaty hands driving this road to my grandparents At and Catrina Van Coller's house. Very fond memories but I remember how scary it used to be. They had a stunning farm and very nice house and my grandfather built this road together with 10 helpers with picks and shovels in 1946. Thank you for this site. I visit SA every year and while my wife is visiting her family, I intend to hire a motorcycle and go riding. My imagination to ride mountain passes has been kick-started by your web site. Excellent website!!! Please keep it up. Kind Regard Johan. "I have had an interest in SA Mountain passes for many years and have driven most of the easy ones. I just want to let you know how much I enjoy your articles. Thank you for the time and effort you are putting in to provide this info"
"I have just browsed through your website of the Mountain Passes of South Africa. I really enjoyed it, especially the one on the Baviaanskloof and in particular "Combrink Se Berg" pass. My Father and I bought those farms in roughly 1947 and subsequently effected all the developments there. I personally built the cableway in 1961 and have just finished writing the whole story about it, because I had so many requests from family and friends as well as other interested parties in the tourist industry." "The perfect website for roadtrip planners. Thank You"
"I just discovered your website this weekend and I must say it is brilliant! Well done. Awesome – professional, well put together and with a lot of content. You must have had / are still having a lot of fun travelling the beautiful country of ours filming and taking it all in." "You have produced the most fantastic web site! We are visiting SA for the 2nd time in Dec this year and will hope to experience a few of these scenic routes, especially those closer to Stellenbosch. We found this site the best touring site ever! Extremely helpful and informative. Please don't stop. Mike"
"I had a look at the Bains kloof pass video, because I have never been there before seeing that I have Acrophobia J now I know exactly what to expect! I really enjoy your video’s. I found them to be very insightful." "Hi there! What an incredible site! I am looking at a massive expedition for next year and hoping that we can partner up for the project. I am going to attempt to be the first man to cycle every single mountain pass in South Africa. You are the pro here! "Your site is tremendous! How about doing the Bedrogsfontein Pass on your current trip?" " You really have already produced a massive contribution to your subject, and have been generous in sharing with many. I look forward with eager anticipation to viewing your final work in due course." "Hi.. Really enjoying your site. I am extremly familiar with the hills and mountains of the Orrie Baragwanath Pass and surrounds. I am reasonably clued up with the history. I have been guiding groups through the strydpoort/mafefe area for (give or take) 15 years." "I am so impressed with your excellent work on these passes, and you are the first person in my 9 years of developing a unique GPS-based South African Travel Information / Destination Guidance System who obviously thinks exactly like I do!" "Hi there, I found this site a few months ago. I absolutely love it! Thanks!" "Really enjoy this site, very informative and very helpful."